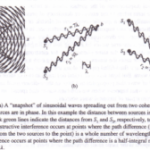 Waves emitted by a radio transmitter are usually linearly polarized. The vertical rod antennas that are used for cellular telephones in automobiles emit waves that, in a horizontal plane around the antenna, are polarized in the vertical direction (parallel to the antenna). Rooftop TV antennas have horizontal elements in the United States and vertical elements in Great Britain because the transmitted waves have different polarizations. perpendicular to the polarizer axis; only the component o~if ~ar~llel to the ~larizing axis is transmitted. Hence the light emerging from the polanzer IS linearly polanzed parallel to the polarizing axis. When unpolarized light is incident on an ideal polarizer as in Fig. 34-18, the intensity of the transmitted light is exactly half that of the incident unpolari~d light, no matter how the polarizing axis is oriented. Here’s why: We can resolve the E field of the incident wave into a component parallel to the polarizing axis and a component perpendicular to it. Because the incident light is a random mixture of all states of polarization, these two components are, on average, equal. The ideal polarizer transmits only the component that is parallel to the polarizing axis, so half the incident intensity is ~smitted. What happens when the linearly polarized light emerging from a pol~zer .passesthrough a second polarizer, as in Fig. 34-197 Consider the general cas~ m which ~e polarizing axis of the second polarizer, or analyzer, makes an angle ~ With~e polan~- ing axis of the first polarizer. We can resolve the linearly ~la~1Zed light that IS transmitted by the first polarizer into two components, as shown in Fig. 34-19, one parallel and the other perpendicular to the axis of the analyzer. Only the parallel component, with amplitude E cas ¢, is transmitted by the analyzer. The transmitted intensity is greatest when ¢ = 0, and it is zero when polarizer and analyzer are crossed so that ¢ = ?Do. To determine the direction of polarization of the light transmitted by the first polanzer, rotate the analyzer until the photocell in Fig. 34-19 measures zero intensity; the polarization axis of the first polarizer is then perpendicular to that of the analyzer. transmi~ at angle ¢. 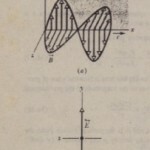 This relation, discovered experimentally by Etienne Louis Malus in 1809, is called Malus’s law. Malus’s law applies only if the incident light passing through the analyzer is already linearly polarized.